A puzzle game all about the love of food and flavour. Mina is the kind of protagonist many girls will empathise with. She frequently falls into bed with all her clothes on, always seems to have messy hair, and is too shy to point out to her innkeeper that, no, actually, she isn’t a young lad. She’s also fed up with living with her parents in the middle of nowhere and dreams of making something of herself in the big city. I empathise with Mina, but most of all I empathise with her love for food. After stealing money from her parents and running away to the kingdom of Victusia, she enters a tournament to win a place among the Chef Brigade, a group of noble warriors who rid the land of monsters then turn them into dishes. To win battles, you have to wow the judges with your refined palette and masterful use of ingredients. Battle Chef Brigade is unabashedly carnivorous. A lot of the game is spent hunting a variety of beasts with knives and magic before transporting their tasty hides back to the kitchen. One of my favourite things is watching the monster you’ve just killed instantly transform into ready-to-cook pieces of meat and fish. You feel a little bad hurting the Cheepchis (flying chickens that are very fluffy and fat) but the annoying Squickle (blue squid) deserve to be served up on a bed of fresh greens for nibbling on your ankles. I’m not too invested in the storyline, where Mina and the Brigade set out to cure a mutation that’s affecting the monsters. I just want to beat everyone in the kitchen colosseum. The food is marvellous to look at, if a little weird. I present the judges with a plate of Squickle tentacle garnished with a Cheepchi breast and eggs medley; a noodle soup thickened with a chopped dragon heart; and stir-fried, seasoned Baurun ribs. One of the judges hails my vermicelli dish as pure and beautifully complex, which is exactly how I’d describe myself. To celebrate I go to the market and buy some things to improve the range of flavours in my food, including a bag of earthy herbs specifically for a green-skinned judge who coos every time I cook. 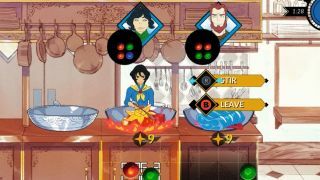 Being a puzzle game, there’s more to Battle Chef Brigade than being a culinary whiz. Battles are all about lining up elemental flavour gems according to the taste preferences of your judges, and incorporating a key ingredient chosen by the grand master. Sometimes you have to make three dishes at once for judges with different palates, or find a fruit that only grows on mountains. It’s stressful, especially if you don’t have the right utensils—or you waste time wondering if you should add some bone to your broth, or perhaps make a sauce from Cheepchi eggs. I’m enjoying Battle Chef Brigade, but I just have one important question: does it make me a bad person that I really want to eat dragon heart now?